Those in colder climates have long appreciated Saabs for their multitude of safety features and their front-wheel drive when battling through inclement conditions. To bolster its cold weather reputation, the manufacturer is now offering all-wheel drive on its 2008 9-3 Turbo X, a potential saving grace for a company that should have gone there before now, especially since the competition in the field continues to get tougher. Add the fact that this cutting-edge safety system is enveloped in a black four-door sedan that looks killer and has kick-out aggressive driving potential, and you’ve got yourself a car that will laugh in the face of Nor'easters. The interiors of both the sedan and wagon are commodious, with rear seat fold-down options in each to provide three-dimensional expansion. Controls are intuitive and easy to grab and use. The seats are very firm but still comfortable for even the longest of drives. Its exterior looks are distinctly Saab, but design elements add a very non-Swedish assertiveness. We hate to be an echo in the choir of automotive criticism, but even with its prodigious torque, it is hard to parse why Saab did not stretch for 300 horsepower – as both Volvo and Subaru have done with their hot rods. There is great grunt to its early-rising, late-to-bed torque band, but the snap of horsepower, particularly in lower gears, is lacking. This car provides nothing but satisfaction in most areas. It is smooth, subtly fast and whisper-quiet as its nose pushes through the air. There is some understeer, common to all-wheel drive cars, but that is easily corrected with just a slight wheel adjustment or use of the throttle to steer out of bad situations. Four wheels gripping, braking, or swapping power, beat two any day, especially when you are dancing with almost 300 horsepower and abundant torque. The electronic limited slip differential, a second coupling in the system, distributes torque as needed – and fixes driver mistakes. There is virtually no body roll unless pushed harder than it should be pushed on a public road, and acceleration and rapid braking do not induce front-to-rear see-sawing as can be common. The singular powerplant for the Turbo X pumps the power, at 280 horsepower and a whopping 295 lb-ft of torque, through a 2.8-liter V-6 water-cooled, high-output turbo with virtually no turbo-lag. Transmission options include six speeds in both manual and automatic form. The direct control of the manual is a definite winner in this contest and will be particularly useful in performance conditions. Spoilers at the rear of both the sedan and the wagon are functional, reducing the chance of the rear lifting at high speeds – and keeping it planted in cornering. In addition, standard fare is abundant, with a Bose Centerpoint sound system, a six-disc in-dash CD changer, MP3 capability, rear fog lamps, dual titanium exhaust pipes, eight-way power front seats, a power moonroof, dual zone climate control and power windows and door locks. Optional equipment includes a DVD navigation system, steering-wheel-mounted audio controls and heated front seats for those cold nights out testing the all-wheel drive system. The Haldex 4.0 all-wheel-drive system, plopped onto General Motors' existing Epsilon architecture, has been named XWD (Cross Wheel Drive), reflecting the system's ability to send torque across the rear axle. It can send power front-to-rear and back, or, in the rear, side-to-side. You can feel it fixing your mistakes, but more importantly if you like to drive aggressively, it lets you reach the mistake point before it intrudes. This system, developed by Saab and Haldex, will make its way into other GM models on the same platform, such as the Saturn Aura and Chevrolet Malibu, and will be available, at a price, to other manufacturers. Gas consumption could prove disappointing for the liberal set that, even Saab says, favors this Swedish icon of safety, sensibility and social concern. There are no official figures as yet, but it appears that, at best, it might approach 20 miles per gallon overall. The tightly constructed, elegant and utilitarian interior appointments come to life in rich leathers, aggressive stitching, huge dials for major controls and a grip-me-please fat steering wheel. Wonderfully bolstered seats say sports car, in both the Sport Sedan and SportCombi. For the cognoscenti, there's also the turbo boost gauge, taken right from the '80s 900 Turbo. First, fade to black, for that is the only color in which the Turbo X is cloaked. The snake-eye headlamps, reflected in the slanted gills, are bookends to a classic Saab grille. Saab has brought back the iconic clamshell hood, though in this case it hovers above a lower fascia with a gaping, air-sucking mouth and broadly spaced fog lamps that look ready to devour all they approach. The designers have taken such a well-defined car and transformed it – and yet left it immediately recognizable. Starting at $42,510 for the Sport Sedan and $43,310 for the SportCombi, options can have you dancing on the $50,000 line should you choose. That's a hefty price, but then again, the Saab Turbo X is a limited production car that many 1980's-era Saabophiles should want to drive – and many can afford it. We see it going head-to-head with other AWD models, such as the Audi A4, Volvo S60 R, BMW 3-Series and Mercedes-Benz C-class. 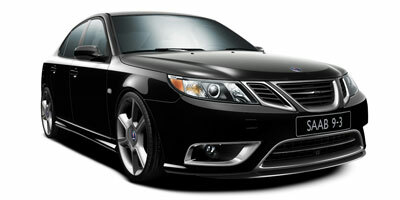 Saab, which under GM control seemed to lose some of its outsider edge, has come back in a big way with the 9-3 Turbo X. Anyone who sees it in its bold black ferocity will either recognize it as a car paving a way to the future for Saab, or as a modernized flashback to the ‘80s, when Saabs were acceptable both as counter-culture cars and hot rods. By adding all-wheel-drive, stability and traction control as standard fare and surrounding it with Saab's well-known protective outer architecture, this car now stands among the safest in the market.